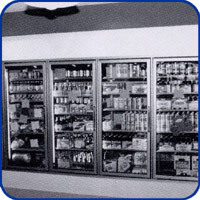 Advance Energy's "Kwik-Lok walk-ins" are designed for use in large coolers, freezers and warehouses. The kwik-lok has several advantages. It applies to more custom size boxes and gives the customer much more flexibility in design. These walk-ins cater to the custom project and can be designed to fit your needs. The walls, floors and ceiling panels are of cam-lock construction and are manufactured with superior dimensional accuracy and cosmetic appearance.